RePub, Erasmus University Repository: Transition versus transformation: What's the difference? Transition versus transformation: What's the difference? ‘Transition’ and ‘transformation’ have become buzzwords in political and scientific discourses. They signal the need for large-scale changes to achieve a sustainable society. 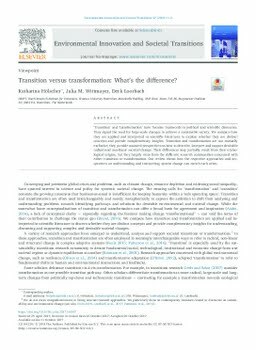 We compare how they are applied and interpreted in scientific literatures to explore whether they are distinct concepts and provide complementary insights. Transition and transformation are not mutually exclusive; they provide nuanced perspectives on how to describe, interpret and support desirable radical and non-linear societal change. Their differences may partially result from their etymological origins, but they largely stem from the different research communities concerned with either transition or transformation. Our review shows how the respective approaches and perspectives on understanding and interpreting system change can enrich each other.